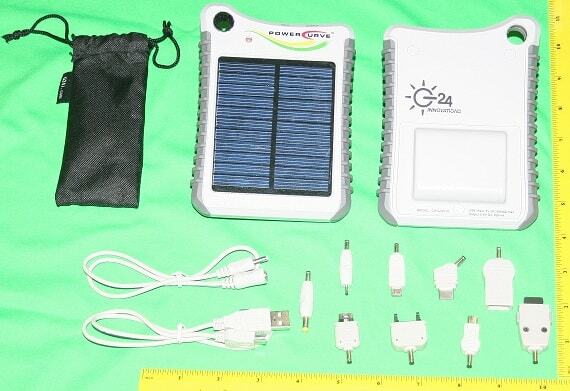 I found a neat little SOLAR CHGARGER for charging all my personal electronics such as my cell phone, MP3 player, and my GPS. It is the G24 INNOVATIONS Power Curve. I have used both of mine for over one year without any problems. They are lightweight and easy to use. The POWER CURVE’s below were purchased at a local sporting goods store and cost approximately $39.95 (worth every penny to me!). The POWER CURVE consists of a 0.8 watt photovoltaic Solar panel and 1200 mAH NiMH high temperature battery for use outdoors. Included are numerous accessory tips for charging and operating the following brands: LG, Samsung (thin), Samsung (wide), Blackberry Strom, Sony Ericsson, Mini-USB, Nokia 2mm, PSP 4mm, USB/iPhone. Cables included are a USB charging cable and a DC cable for the tips. Upon opening the package I observed that the POWER CURVE was partially charged. Placing the unit in the sunlight on my truck dash, I immediately noticed the red LED charging indicator came on and remained on until most of the Solar panel was covered up. Once home, I connected my G24i to a USB port on my computer and fully charged the unit for 6 hours, which is recommended by the manufacturer. The only problem I have noticed is that the red LED does not turn off when fully charged. However, there is an internal shut-off that disconnects the charging circuit to avoid overcharging the unit. Using the POWER CURVE is easy, just plug in your device and wait approximately 2 -3 hours for it to fully charge. The batteries are special high temperature NiMH cells to allow use in warmer areas. I personally have used the POWER CURVE from the city/urban areas to farmland to the hurricane afflicted areas of the Gulf Coast without any problems. It’s use always insures that my personal electronics will have an ample power source when needed. Cleaning the photovoltaic panel is easy using a water dampened rag. No harsh cleaners or chemicals should be used. Everyday use in work and play has resulted in my attaching Velcro on the back of my units allowing it to attach it to the dash of my truck and car and using a non-climbing/non-load bearing Carabiner to secure one to my Bug-Out bag and other equipment. When you can not take a electrical charger in the field with you, the POWER CURVE is ideal. I really need to look into this item. It sounds very cool. I have a few things that need charging from time to time and this would also be great to take camping to keep my cell charged and the Ipod too. Wow! This is neat! And the lowest price I’ve seen! Thanks for your blog!!! I’ve never seen one of these, but they look really interesting. I’m going to have to research it a bit more, but I can see myself owning one of these very soon. Thanks, Jim! Does anyone know of a good solar system that would power a small appliance for say….8 hours? does this work with a smart phone? amazon had some conflicting reviews on it. I have a Power Curve and its charging cable but not the output extension cable or its adapter set. Can you tell me the output port coax connector dimensions so I can fudge something to get it working with other adapter bits I have? 2.5×1?